When they were friends, she asked him, "What do you think is the most important thing in a relationship?" 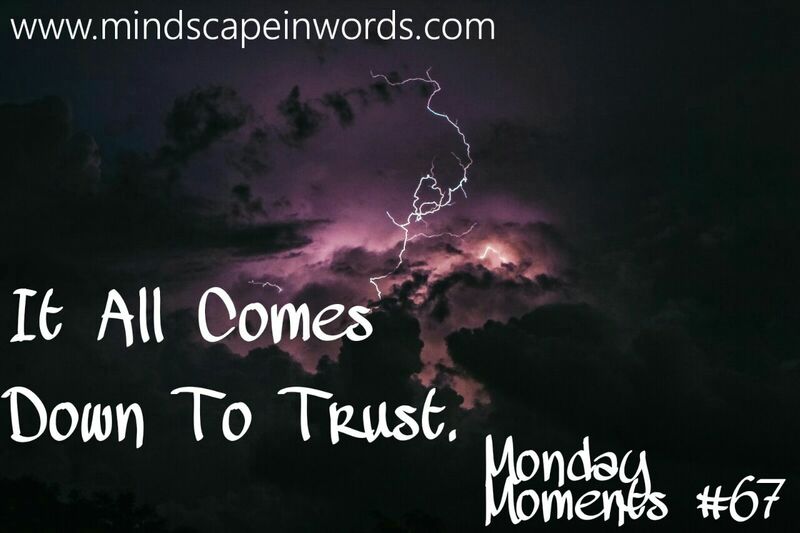 "Trust", he answered. She said, "For me, it's love." A few months went by and now they were in a relationship. From the smitten with each other phase, they were in a possessive for each other phase. That day, they were talking on the phone at 3 am. But then, she got another phone call from her friend. This guy was her best friend for years. They shared everything with each other which is why she said goodnight to her boyfriend and picked up her best friend's call. They talked about his problems at office and how much he missed his ex-girlfriend and how much he wanted to leave the country and do what he loved. After an hour of listening and talking and assurances, they both slept. After a few minutes, her boyfriend called to ask who she was talking to. What she dismissed as being cute about his possessiveness came to bite her late. Every time, she talked to her best friend, he had a problem. Every time, she would go to his home, he had a problem. So much so that he started stalking their online 'last seen at'. They fought all the time. She wondered how she was okay with him flirting with every girl but how it was not okay for her to just talk to her best friend. After a couple of months, there was less romance and more jealousy. Their relationship felt more like work and less like comfort. True love should be able to overcome everything. It should be like a bird flying higher, not like a bird in a cage. And when it starts to feel like a bird in a cage, there's nothing much left to say. For him, he didn't want to lose her because of his insecurities. But, he failed to realise that he was clobbering her. It isn't a comprise if it comes at the cost of freedom. For her, she was never restricted to do anything and now that she was, she became someone she was not. The butterfly became a caterpillar. And the moment she decided to change for someone, was the time she didn't choose her first. Now, when they were in a relationship, she asked him, "What do you think is the most important thing in a relationship?" "Love", he answered. She said, "No. It's trust." And she walked away because she had to save herself because no one else would. I totally agree with this! If you don't have trust in a relationship, how can you depend on one another? You write beautifully. LOVE look at this topic--I like that SHE was strong enough to WALK AWAY!! This is so powerful. Trust is so important to any relationship, not even just a romantic one. I love how strong the woman is, and that she recognizes her own self worth. I loved this. I have gone through a similar experience and I do believe that trust is very important. Also I think that if you have a friend who is a guy, and you also have a boyfriend, you need to figure out who is more important. I had a guy friend who I confided everything in. We were the best of friends for 8 years, but once his girlfriend now wife found out that he talked to me more than her, and that we were so close, he ended our friendship and said she means more to me than you. It hurt a lot, but I do understand that now, you have to have guidelines, boundaries and make that choice of who comes first in your life. I love reading these. She is so strong! And yes, she had to save herself. 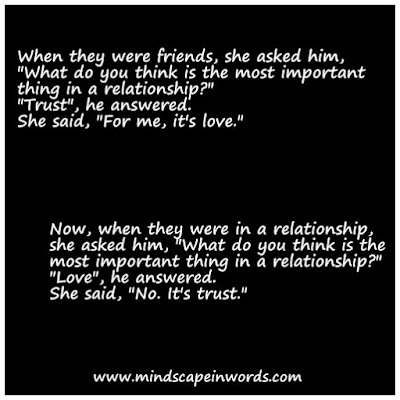 Trust is such an important factor in a relationship.